Of the many retreats and intensives I have participated in, this retreat provided me with the deepest, most healing, most connected experience of community I have known. We can live in love. – D.L. I was deeply inspired by the sincerity of intentions of every participant…. [We] became a support to each other’s work. Which was absolutely beautiful. I felt at ease, supported, curious, joyful, strong, compassionate…. During my first unwinding, I had a deep landing in my being along with deep feelings of love to myself and everyone in the group. Then it was really easy to stay present…. It allowed me to feel a deep sense of respect from within every cell of my body, rather than just being a mental construct. – A.S.
Forgiveness and compassion includes myself as well as others. – Marie M.
The group setting was very helpful. Seeing the depth of commitment of all (especially the males) was very inspiring to me. The afternoon that one participant had his breakthrough and we all buddied up with him was very inspiring. Seeing the release of emotion again mainly by males made it easier for me to reach in deeper and feel my emotions and also to express them…. Able to listen to my wife and really hear her… – J.S. Forgiveness is freeing to all involved. Compassion can be born out of suffering. – Karen C.
I left with a sense of belonging…. Reaffirmed some existing insights and helped me more deeply understand others. – L.
Discovered fears to open heart and be seen. Working through that with grace and receiving feedback was very healing…. Finally able to identify key lies I tell myself. – S.P. I came face to face with despair, Released it – made Friends with it and received my freedom. – D.S. The pieces of my life came together with clarity and precision I did not know was possible. – Clayton L.
The Retreat was beyond my wildest expectations and imaginings. It was an awesome, miraculous experience that has touched me deeply and transformed my life. – N.M. Seeing the depth of commitment of all…was very inspiring to me. – J.S. This is a beautiful, wise, transformative book. 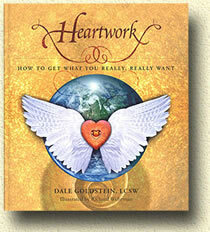 It offers a deep and truly integrated understanding of the heart.